In December, 1899, a wooden, two-room building that was to become the Old Hyde Park Art Center was built at 705 DeLeon Street and used temporarily as a school while a permanent red-brick building, called the new Hyde Park Grammar School, was constructed, at 502 South Boulevard and completed in October 1903. This elementary school replaced the Hyde Park Grammar School, which had been built in 1889 at the southwest corner of Platt Street and Magnolia Ave.
South Boulevard was Tampa’s western city limit and many people protested about “locating such a fine structure out in the wilderness”. It was the first public school west of the Hillsborough River. This area was largely orange groves and pastures for dairy cattle. In 1914, the frame building was turned into a lunchroom, and the first hot lunch program in the county was instituted. Parents served the food and hired a cook to prepare it. Cost was five cents a plate. The following year, on August 2, the name of the brick building was changed to the John B. Gorrie Elementary School to honor Dr. Gorrie of Apalachicola, who invested the first ice-making machine while seeking cooling treatment for malaria patients in 1845. He died in 1855. 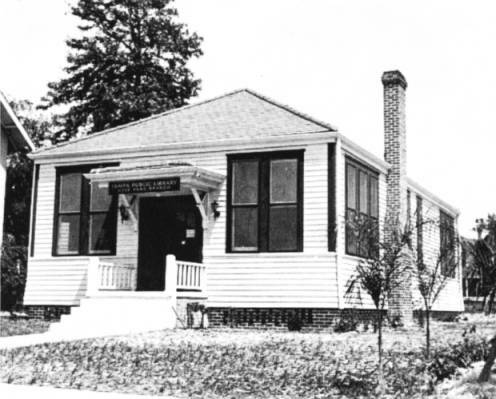 In July 1922, the wooden building became the Hyde Park Branch Library – the first for a public school in Hillsborough County. Sometime prior to 1936, a school called the English Classical School, which was located at 705 Swann Avenue, burned down and the area cleared. In 1936, the wooden building was moved from South Boulevard to its present location, where it served as the Tampa Public Library, Hyde Park Branch, until August 23, 1968, when the City closed it. In October 1968, the Tampa Realistic Artists, Inc. (TRA), which was founded in 1956, negotiated with the City to lease the building as an art gallery, naming it the Old Hyde Park Art Center. As of August 15, 1969, TRA took over the building at 705 Swann Avenue. Formal opening of the renovated building was October 19, 1969. In 1979, TRA arranged to purchase the building for $15,000, which was repaid at $5,000 a year for three years. By June 27, 1982, officers Harry Blank, Treasurer, and Gary Ennis, President, held a mortgage-burning celebration. The Old Hyde Park Art Center pre-2014 exterior remodel. In 2014, with help of the Hillsborough County Historic Preservation Grant Program, the Historic Hyde Park Garden Club and Keep Tampa Bay Beautiful the Old Hyde Park Art Center's exterior was renovated. Later in 2015, we updated the interior with thanks to local fundraising and hardworking volunteers: new walls, paint and a modern hanging system for the artwork shown monthly. New walls up and painted.